Jennifer Dabenigno moves a potted plant in a home in North Reading. Typically, prospective home buyers decide within a half-minute of entering a house whether they like what they see, says Deborah Bernat, a realtor. So it’s critical that those 30 seconds are spent looking at the layout of the kitchen, the detailing in the living room, and the convenience of the floor plan – not the occupant’s wedding photos or, worse, disorganized stacks of paperwork. That’s why Bernat, who is based in Wellesley, works with stagers on her listings. Professional stagers, many of whom are certified and accredited, are trained to make furnishing and decorating decisions that will show houses off to their best advantage for prospective buyers. But despite what some homeowners might think, most professional stagers do not spend their days buying eye-catching accessories and faux artistic paintings at HomeGoods. “It really has to do with neutralizing the space, making it easier for a prospective buyer to imagine living there,” Bernat said. And staging isn’t only about swapping out the homeowner’s stuff and replacing it with the stager’s idea of pleasant decor. H. Jessica Gosman, owner of The Prop Shop Home Staging in Newton Centre, is often called upon to stage vacant homes to help people picture how various rooms might be used. Stagers might be paid by a realtor or by a homeowner. The services that stagers offer vary widely, from a detailed consultation to a full day of furniture installation. Many stagers also rent out their own furnishings. Expect to pay anything from $160 for a basic two-hour consultation to $2,500 for a full day of hands-on labor. Some realtors pay all or part of the staging costs themselves. Maurice says she is typically paid for a set number of hours of consulting by the realtor charged with selling the home; a homeowner might then opt for more hours of consultation or decorating. She says homeowners sometimes lose sight of what might be confusing about the house’s layout. Of course, occasionally staging gets personal. Maurice says she has had to tell people to put political, religious, or personal items out of the sight of buyers. But most people who want to sell houses are receptive to how she can help them. “With the advent of HGTV, most people have now heard of staging,” she said. Jennifer Dabenigno, proprietor of Dab’s Interiors in Stoneham, was already a capable designer when she went through a professional certification program, but she believes the dedicated training makes stagers better at their job. And sometimes what passes for staging comes down to one or two changes. When Lisa Sama and her husband wanted to sell their large family home in Westford, their realtor gave them just two suggestions: change the light fixtures from brass to brushed nickel and put quartz or granite countertops in the bathroom. “We followed her advice, and the house sold within a few hours,” Sama said. She suspects that had to do more with the buyer’s wish to establish residency in time for the start of her children’s school year than with light fixtures – but it might have helped them get their asking price. Maureen Poole, an accredited staging professional master and past president of the Boston chapter of the International Association of Home Staging Professionals, works with realtors and sellers south of Boston through her Scituate-based business, Astounding Surroundings Staging. Poole said she explains to homeowners that they should eliminate any distractions from the look of their interior. But years in the business have taught her to be tactful: Rather than telling people that their Disney statuettes or Princess Diana commemorative plate displays are unattractive, she tells them that collectibles distract buyers. Poole also points out a more subtle advantage of staging: If homeowners have gone to some trouble to make their home look a certain way, it suggests they are ready to make a deal. 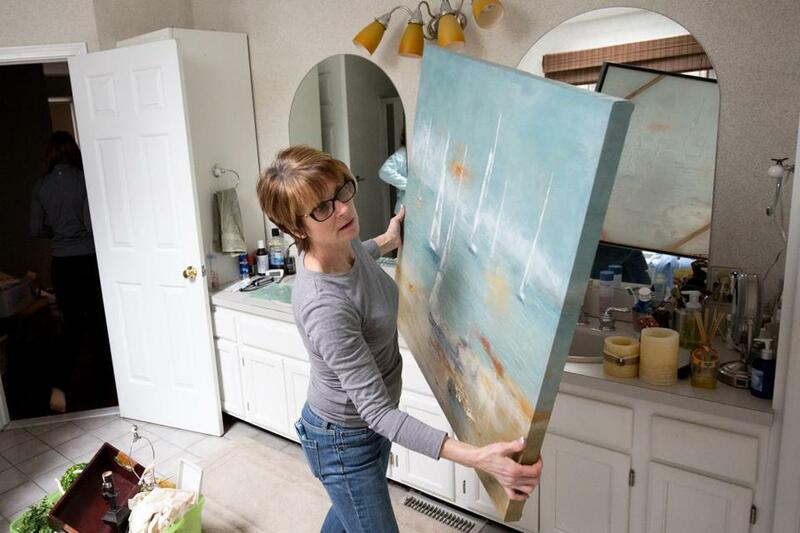 Jennifer Dabenigno moves a painting to a bathroom of a home in North Reading.